Hello everyone! Today I’m going to talk about the Fireant wood burning stove. 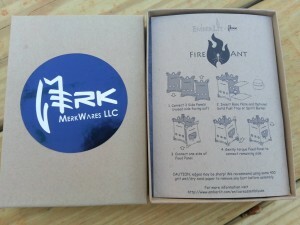 A few weeks ago – the folks from Emberlit asked if I would try their Fireant titanium wood burning stove & write a review. My first impressions: Nice packaging. 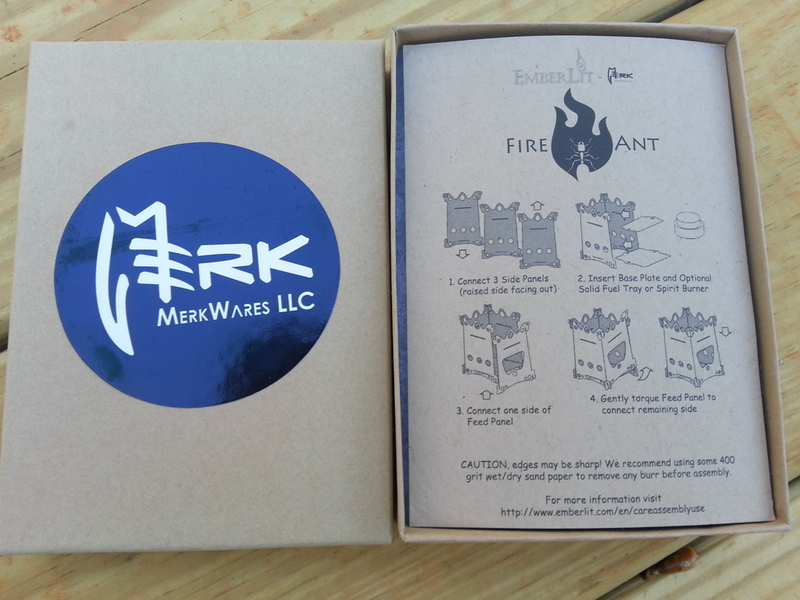 Inside box Includes: instructions on how to assemble, the stove consists of six flat pieces & a pouch to store stove. I’m impressed by the instructions being mostly pictures! but of course I did not read the instructions at first. So I immediately tried to put together the stove. There’s a slot notched in each corner of all the panels which is how they slide/ attach together. Not paying attention to the instructions it was a bit frustrating at first. I just grabbed a couple of the side panels & started attaching. They did not align properly. Which is when I decided to look at the instructions. This is when I paid more attention to details. There are three panels with the same design & one panel with the wider opening/ wood feed hole. One side of each panel is raised. The instructions show the raised part of the panels facing outward. I get 3 sides attached to each other – add the bottom piece & the Esbit tray at top. Attaching the last panel needs it to be twisted just slightly in order to fit it into the slots. Now that I have the Fireant put together I’m ready to get this little stove cooking. I used a Snow Peak pot for testing with the Fireant. Filled the cook pot a little more than half way with cold tap water. The first thing I wanted to try is the Esbit feature. I used a whole 4gram piece of Esbit. These are the smaller pieces vs the 14gram cubes. I lit the cube and placed it on the top tray provided for solid fuel. It was quite breezy out — the esbit cube was protected enough to burn properly. The Esbit cube I used was not big enough for the wind & the amount of water I used. I’m sure if I blocked the wind the Esbit cube would have performed a little better. When the cube burnt out I was left with barely a few micro bubbles. 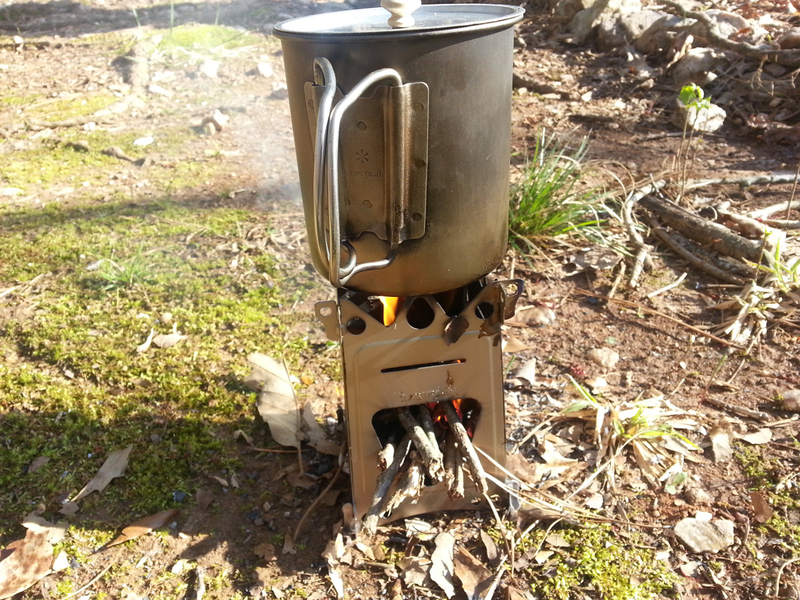 Even though I did not get water to boil due to my lack of enough esbit cube – the Fireant stove does a good job as a solid fuel burner. The tray that holds the esbit is close enough to the top to get enough heat on the cook pot. I want to mention that the Snow peak pot I used is the smallest size cook pot I would suggest. Anything smaller would probably not sit properly on top of the Fireant. One thing I noticed — the Snow peak pot did not sit level on top. It rocked ever so slightly. In the picture below you can see a space between the pot & the stove on the right side. On to the wood fire! After the Esbit was done – I let the stove cool down which only took a few minutes. I disassembled the stove to remove the top solid fuel tray. Put it back together using the four sides & bottom. I first gathered the thinnest twigs & got a fresh pot of water. This time I filled the Snow Peak pot with cold tap water. I placed a bunch of small twigs into the stove – then grabbed a few dry leaves. Crunched up the leaves over the twigs & started the fire using the dry leaves. Normally on the trail I’d have a cotton ball with vaseline to start the fire quicker. So yes, it took a few batches of dry leaves burning on the twigs to get this going. I kept feeding the stove through the top of tiny thin twigs for about 5 mins. Placed the pot on top of the stove & continued to feed through the wood hole. This time the pot sat level on top of the stove. The thinner twigs really didn’t get the fire hot enough. So I grabbed a few thicker twigs – pointing them upwards towards the pot. Once they caught fire I had boiling water fairly quick. The Fireant seems well constructed. Once it’s assembled it creates a strong fire box with the ability to hold your cook pot. I have not tested with cook pots any larger than the Snow Peak shown in these pictures – so I can not say from experience how big of a cook pot it can hold or water weight it is capable of. Something I will follow up on here if I attempt to use larger pots with more water capacity. It’s titanium & has a small footprint – so its lightweight. 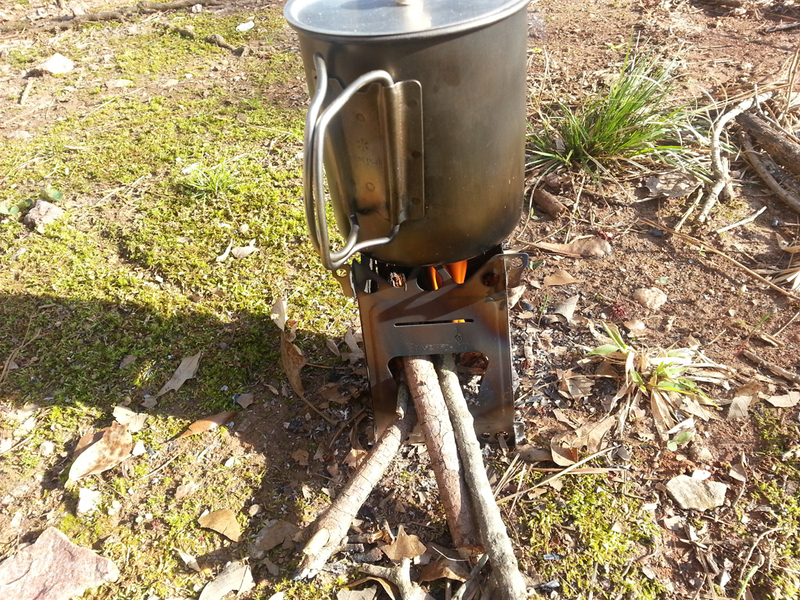 Compared to other setups – fuel, pot stand & stove. With the Fireant you don’t need to carry fuel or a pot stand. It’s a self contained unit with multi fuel options. 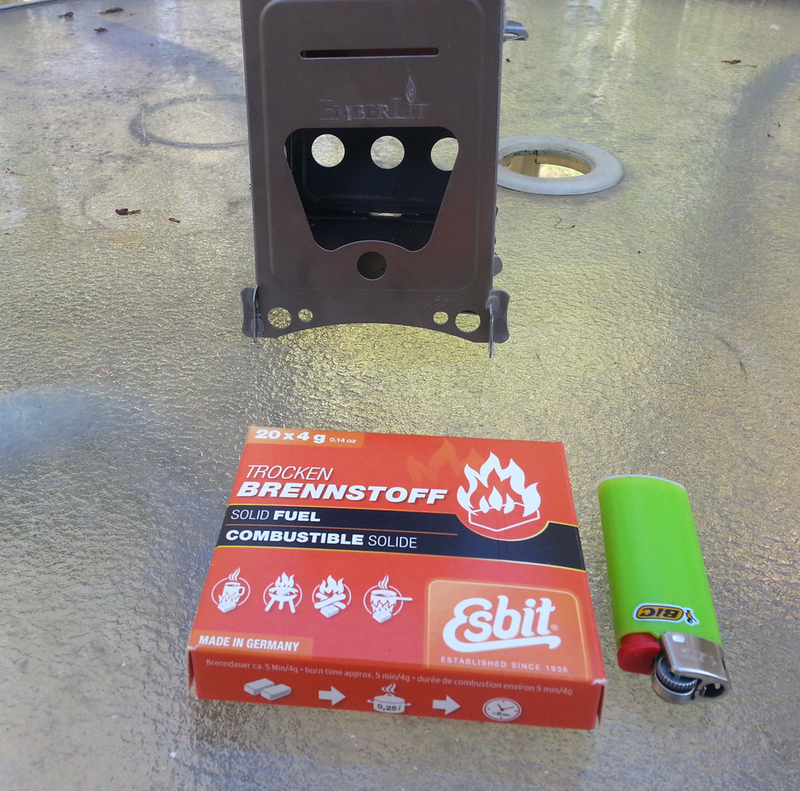 Besides Esbit & wood fuel – you can use the Fireant with an alcohol burner. So many options for whatever cook style you choose. It packs down to a small size which easily stores in the pouch included. 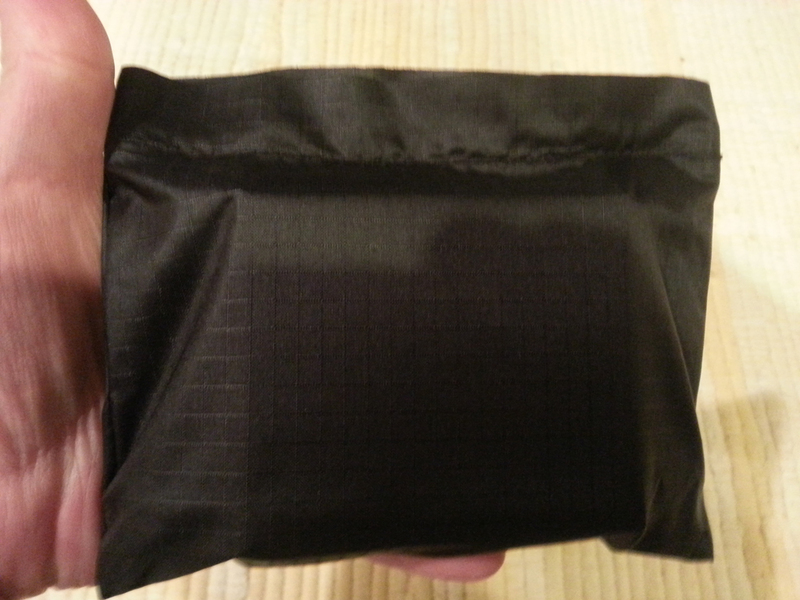 The pouch material is a sil nylon type so it appears it should keep your gear clean after storing a dirty stove inside pouch. 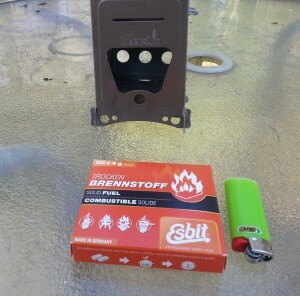 I also was able to fit the small pack of Esbit in the pouch along with stove. Being it’s small means you have to feed twigs into it more often to keep it going than larger fireboxes. However, you can keep it going if you want to boil multiple pots of water. So if you pour water in a dehydrated meal – then want boil more water for a tea/ coffee or for another person. Easier to keep this going then adding fuel to alcohol burners or using multiple Esbit cubes. These types of stoves are typically for those who want to sit, relax, enjoy the surroundings, get the smell of a small campfire & take your time burning twigs while waiting for water to boil. Any questions please post below – I’ll try my best to answer. So…it works and is well made yet…did you like it? Would you buy one and probably use it? 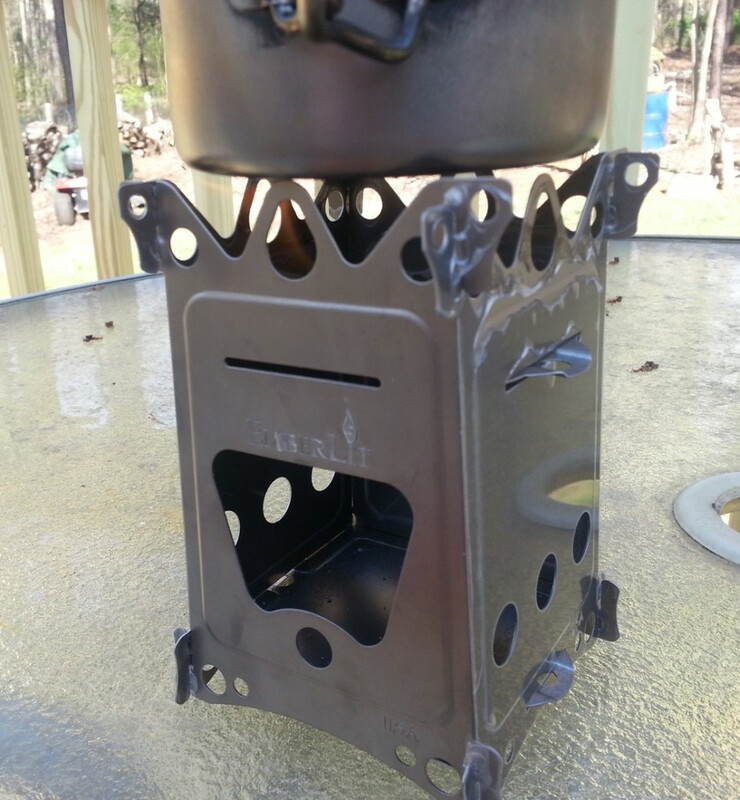 Thanks for the review – I have been trying to decide between an Emberlit Fireant, a Nomadic Stove Company Trekker Ultra .006 (like a Solo but lighter), or the Evernew DX Stove. I’m leaning toward the Fireant because it packs down flat and can accommodate wood, Esbit or an alcohol burner. One critique of your review that I have is that you mention that “the Snow peak pot I used is the smallest size cook pot I would suggest” but you never mention what sized Snow Peak pot you were using. Would you mind editing the review to include the pot size? As I am going to buy a pot / mug to go along with my Fireant, I’d like to get a compatible size.